Are All Windowless Air Conditioners the Same? How to Drain Water from a Windowless Air Conditioner? The windowless air conditioner has become a popular choice in many homes today especially in an apartment without windows or central air. They are self-contained and very useful since they don't need ductwork to work. If you are looking to invest in a windowless air conditioner, then you are in the right place. We've compiled some of the best models to select from including a brief overview of each product. This article will guide you on how to choose an efficient windowless air conditioner that will suit your home needs. Ideal for Rooms up to 150 sq. ft.
Before you invest in a windowless AC there is a certain criteria you need to consider. Here are some of the things that will help you determine which kind of model suits your needs accordingly. This is the main point to consider when you want to buy a windowless AC because it's the framework that regulates the efficiency of air conditioning. The cooling power of all windowless AC is measured in BTU’s (British Thermal Unit). The power required will vary depending not only on the size of the room to be refrigerated, but also on other features built-in your home including insulation, sunshine, numbers of openings, and type of ceiling. 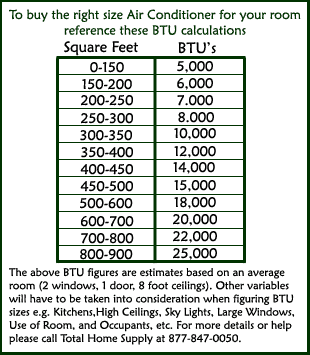 Your first task is to measure the size of your room in order to establish the amount of BTUs essential for your space. In simple terms, the higher the BTUs, the higher the space that can be air-conditioned. This is another critical point because the windowless AC is an electrical device that operates by consuming a lot of energy. We recommend you find a model that has the least energy consumption rate. Therefore, look for models with an "Energy Star" rating logo or higher energy efficiency ratio. Generally, a unit with a lower EER rating of five is most definitely consuming more energy than a higher rating of 10 which is more energy efficient. Remember, to choose a model that is adapted to the size of the space to be cooled since it will consume efficient energy by producing just the required amount of cooling experience. The noise level of your air conditioner is a factor to consider because nobody desires a unit producing a lot of noise around them. Recommended noise level ranges are between 55-70 dB for any AC. Above that, the noise may be irritating and disturbing to your eardrums. However, some windowless air conditioners come with a silent or night feature which allows you to enjoy a quiet and cool atmosphere. In some models in our list, the windowless air conditioner acts as a dehumidifier which eliminates dampness from the surrounding air, providing freshness to the atmosphere. The dehumidifier capacity is measured in liters per hour. Not all models have this feature built-in, so it depends whether you need an air purification function in your windowless air conditioner. Having a model with a thermostat function allows you to run your AC for a selected period. In most cases, a windowless AC with integrated thermostat function automatically switches off when the desired temperature is reached. This feature is advantageous since you are able to control energy consumption and prevent premature wear over those models without. 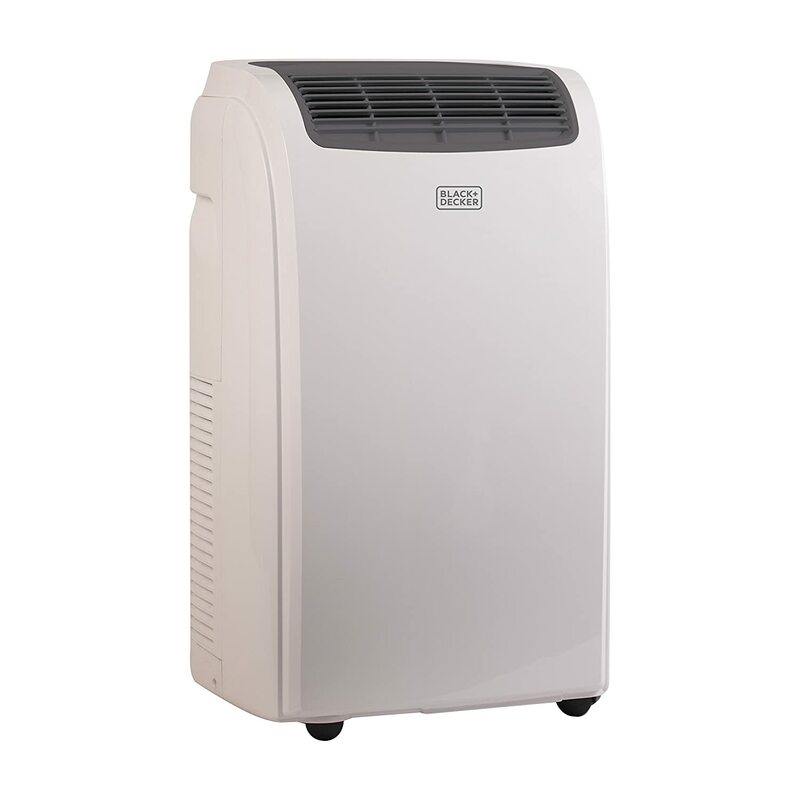 BLACK + DECKER 10000 BTU Portable Air Conditioner Unit is the best overall unit on our list. It’s one of the best windowless AC since it cools, dehumidifies, and ensures continuous circulation of air even in summer heat. Its operation is quite convenient with the help of the remote-control feature. This enables you to enjoy cool air by accessing your unit features from anywhere in the room. In addition to control, there is an LED digital display which provide simple, smooth operation and with a 24-hour off/off timer and sleep mode setting. Its vertical motion design builds steady airflows, keeping room temperatures consistent over time. A slide out filter also comes in handy as it can be easily cleaned and reused. With the use of four wheels movement of the unit is made easier. On the flip side though, it only works on double-hung or sliding windows. One of the main reasons why people may seek out this unit is its portability. However, it works best in small spaces and for those who want to take cooling from room to room. Above all, it is considered attractive and does not block your view out the window. The Honeywell HL10CESWW Contempo Series is among the most powerful and stylish portable air conditioners available in the market today. It is very dependable as it combines a 3-in-1 technology with a sleek design that complements any room decor. When it comes to cooling, Honeywell HL10CESWW Contempo Series has an automatic wind motion that is vertically placed to distribute cool air evenly, fast, and consistently. The whole system has been designed to offer maximum comfort. It incorporates digital controls, sleep mode option, three fan speeds, a digital display remote control, and a 24-hour energy saving timer. This product has reusable dual filters that are structured to offer protection against hair, pet dander, and dust entering the unit. This feature prolongs product life and functionality. It includes stress-free automatic evaporation. It also has an in-built dehumidifier that gets rid of up to 80 pints per every 24 hours with an ongoing drain option for long durations when the system is unattended. Another impressive feature for this product has full set window kit for fast installation in horizontal and vertical windows. However, it has a maximum hose length of four feet. When it comes to room cooling, this unit is specifically designed to provide consistent functionality and efficacy. It has been built with high-quality standards to ensure durability and extended product life. 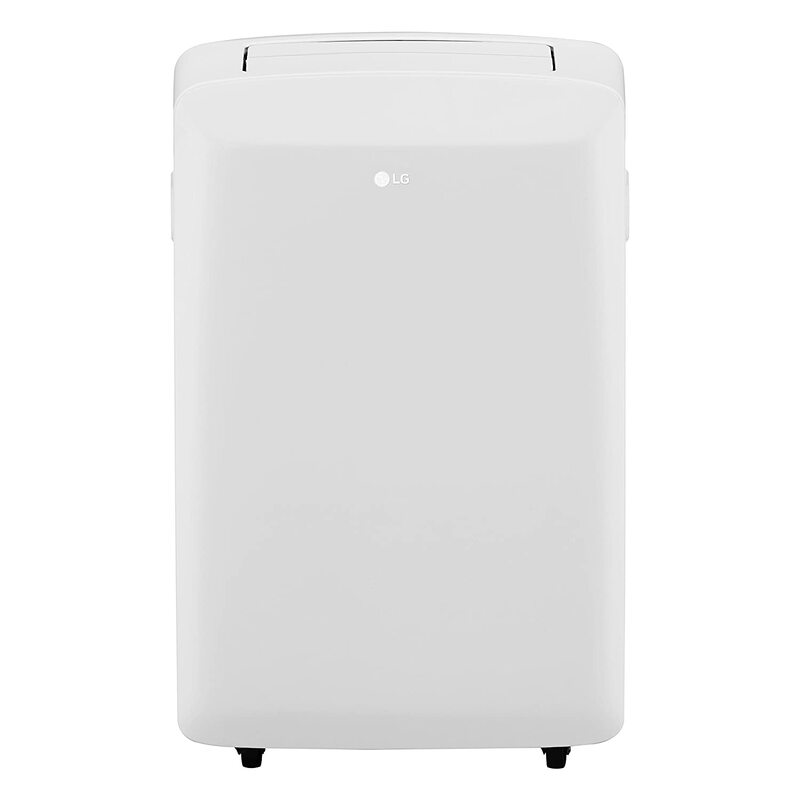 The LG LP0817WSR air conditioner is one of the best windowless ACs for those moving either from room to room or home to work. This unit comes in the third on our list, not just because of its sleek attractive design but also because of several effective features. The auto evaporation system provides continuous air conditioning. However, it can be controlled by integrated 24-hour on /off timer where you are able to control the temperature to your specification. The LG LP0817WSR AC uses a standard 115-volt electrical outlet allowing to perform effectively, just like other models above. The best part of this model is the oscillating air vent technology which ensures complete and efficient cool air circulation to the point of no hot air left unnoticed. Apart from just cooling rooms up to 159sq. ft., it also dehumidifies up to 1.8 pints of liquid per hour. Its maintenance is quite simple with the help of an idicator that notifies you when you need to drain water. This model is a suitable choice if you are looking to invest in an affordable windowless air conditioner for smaller rooms or when you're on the go. It provides sufficient air conditioning when placed upright. It is well-designed with desireable features which enhance its cooling performance and fits well in the room. 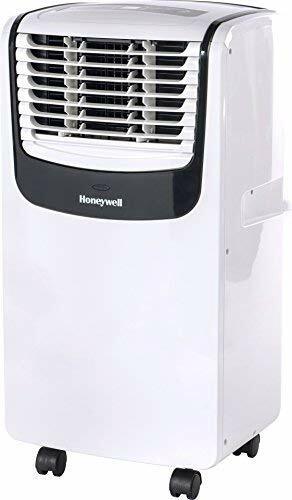 When looking for a compact portable air conditioner to make your room cool and dry at all times, the Honeywell MO08CESWK AC is the best you can find. It’s built to last and offer you peace of mind whenever in operation. It also provides a powerful flow of air and operates quietly with minimum distractions. The product comes with a dual washable air filtration system that shields and prolongs its life. The system also includes a filter change alert for easy maintenance. Its motor and compressor have thermal overload protection to provide extra safety precautions.It incorporates a dehumidifier that eliminates up to 44 pints per 24 hours and a continuous drain option for long unattended periods. It also has a digital and remote control, two variable speed fans, and 24-hour energy saving timer. Another great feature is the auto evaporation. This eliminates the need for a bucket to empty except in high humidity regions. It has an exhaust hose length of 12” to 47”. For ease of installation, the product has a window bracket with a width of between 19.7” to 47.2”. 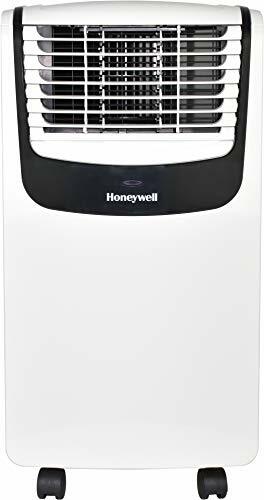 The Honeywell MO08CESWK is considered the best windowless air conditioner available on Amazon for its impressive performance and energy efficiency. Also, it is highly portable and eliminates the struggle of heavy lifting. Are you looking for windowless AC that is ideal for your money? 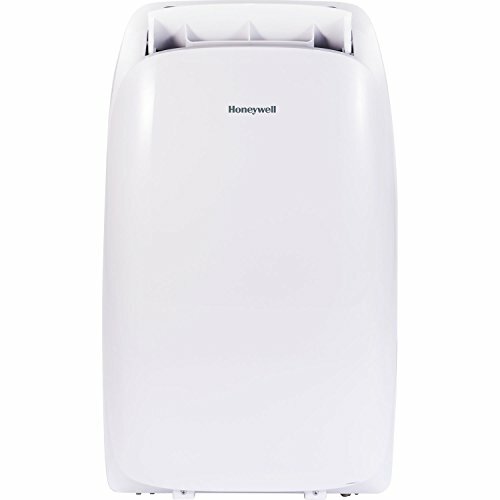 The Honeywell MN10CESWW is a portable air conditioner that offers modern designs that complement all room décor. It has a sleek modern design that makes it very appealing. This product is very dependable, powerful, and safe to use. It is a 3-in-1 appliance offering a powerful cooling, dehumidifier up to 66 pints per 24 hours with the option for continuous drain, and a fan that is responsible for air circulation in the room. It also has thermal overload protection for extra safety. This product is easy to install and maintain. It comes with a full set window kit that allows for quick installation. The maximum hose length is four feet. Besides, its filters are washable and structured to protect against dust and hair for extended performance and durability. 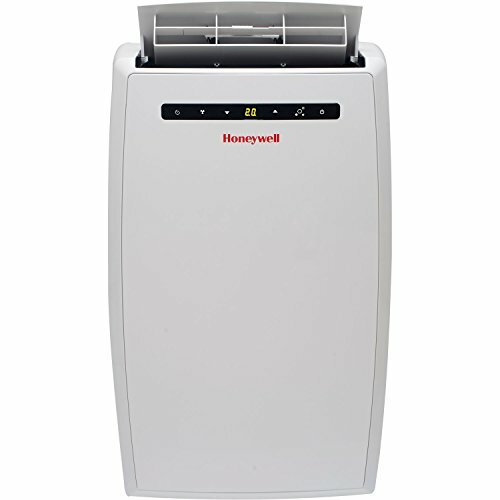 If you are working on a budget and need to feel the value for your money, the Honeywell MN10CESWW AC is your best fit. It’s affordable and is high performance to cool your room fast and consistently. Of all five windowless air conditioners, it's quite clear there are both similarities and differences in every model. However, there is a lot to consider when it comes to windowless air conditioner units which include dehumidification, BTUs, hose assembly, the technology used, and the overall design. The BLACK + DECKER 10000 BTU Portable AC Unit is probably the best overall unit for fast cooling, dehumidification, and consistency in terms of air circulation. It’s also the most affordable and simple to operate unit. The Honeywell HL10CESWW Contempo Series provides similar functionalities with a slight improvement of auto evaporation. However, both models pose challenges in quality control. The Honeywell HL10CESWW Contempo Series is a suitable choice for bigger rooms with a stronger focus on visual design, while the LG LP0817WSR unit, despite its oscillating air vent, produces a lot of noise. Above all, each of the reviewed windowless AC units can work to suit your situation by providing cool, comfortable, and refreshing air. Most of these units are compact and light for easy movement from one room to another. Compared to window air conditioners, these units need little space. They are also ideal for small apartments or studio. 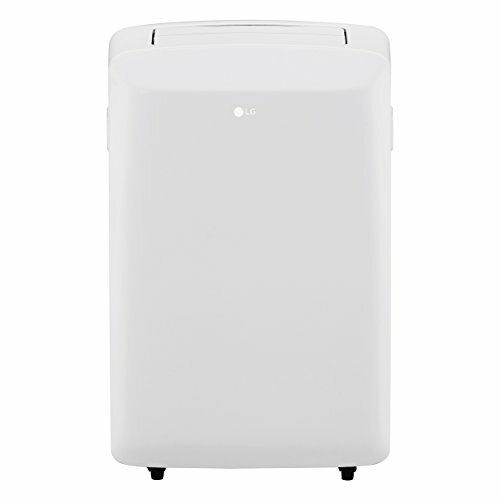 The 2-in-1 feature acts as an air conditioner and dehumidifies air at the same time. All you need is to identify the perfect location, then fix a drain hose downhill, then you're done. Most of them come with thermostat and night mode settings which ensure the AC runs only when needed. It is important to consider all the factors that will guide you in selecting the best windowless ACs on the market. Not all of the above will suit your needs, therefore, evaluate your room requirements and have a budget. To conclude, when choosing your desired windowless air conditioner, find one that is worth your money in terms of performance and efficiency. Our aim is to help you understand more about windowless air conditioners as we strive to answer some of the most frequently asked questions in order to clear any doubts. Are Windowless Air Conditioners Good? Yes, they are perfect AC units depending on your situation. Most of them are portable and you can easily move them around from a room to another as you wish. How Does a Windowless Air Conditioner Work? Windowless air conditioners work with the help of three main parts: a compressor, a condenser, and an evaporator. The cooling effect starts when hot air enters the compressor in a gas form. Eventually, gas pressure increases, which forces itself to the condenser. Once there, the gas cools significantly and leaves the condenser as a liquid. In the evaporator, the liquid turns to gas and takes in heat from the air releasing cooled air to the surrounding. This process continues with the control of the thermostat. 1. Find a drain bucket or move the unit close to a sink. 2. Find the drain plug either on the side or back of the unit. 3. Drain the water by removing the drain plug and stopper. However, once the drain plug is removed, remember to set up the drainage for continuous drainage. 4.Measure the drain port mouth and get a hose of exact width to ensure a water-tight fit. 5.Place your drain hose in the proper position (downhill) for it to be effective. -Note that in order to support continuous drainage gravity must apply.